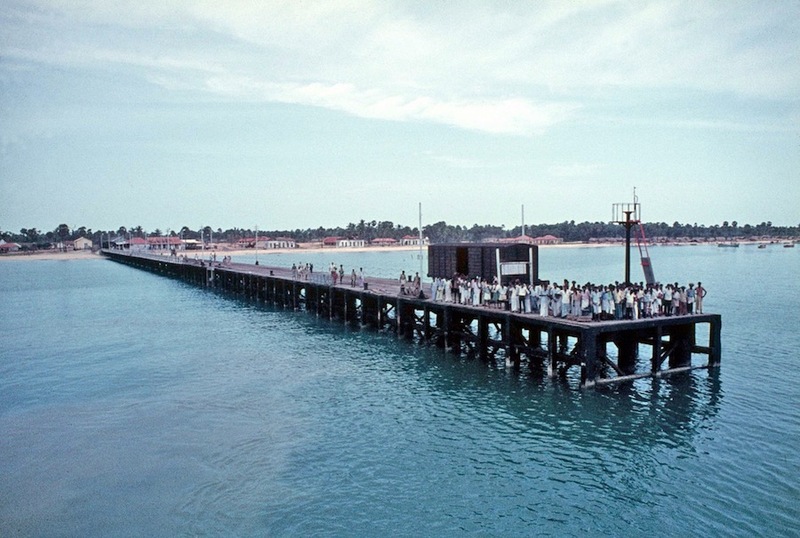 This photograph is of people standing on the Talaimannar Pier in northern Sri Lanka, and is taken in the 1970s. At the time, ferries used to transport passengers from Talaimannar to Dhanushkodi on the southeastern Indian coast as part of the railway service that connected India and Sri Lanka, and back again. Today, this service has ceased to operate, a casualty of the keenly watched, deeply fraught, and highly militarized maritime boundary between India and Sri Lanka. The building and policing of borders – and the means to traverse them – operate at the behest of governments that interested in faster, better, and cheaper itineraries to control, move and resettle people. These ambitions often form the stuff of colonial archives. Few accounts survive of those forced to navigate complicated legal and bureaucratic regimes set up in the brief moments when there is a tantalizing glimpse of what homes and lives could be like on the other side, or of those who risked “illegal” crossings. The same holds true for the Dhanushkodi-Talaimannar crossing. This photograph invites us to think about histories of infrastructure and transport from the perspective of the travelers. These accounts are of course, not in the colonial correspondence relating to India and Sri Lanka. As with other histories of infrastructure and transportation in South Asia, the ferry service (as well as the immigration facilities and quarantine camps that served them) was set up in an effort to link the two colonial economies of India and Ceylon (present-day Sri Lanka). It began operations in 1914 as a joint effort between the South Indian Railway and the Ceylon Government Railway. This was not the first means of traveling across the Palk Bay, nor did the ferry service eclipse older means of traveling across the Bay by means of country boats and catamarans. In other words, people had been traveling between the two countries for centuries, but the volume of travel greatly intensified beginning in the mid-nineteenth century as cheap labor was recruited primarily from Madras in British India to work on the tea plantations and rubber estates in Sri Lanka. Efforts to link Ceylon and southern India by rail officially began at least as early as 1895. The Planters’ Association of Ceylon, a powerful association of tea plantation owners in Ceylon, was particularly interested in finding an alternate route for the transport of laborers (“the cooly traffic”) from southern India to Ceylon. Before the Talaimannar ferry service, laborers recruited for Ceylon traveled by sea from Tuticorin (present-day Thoothukudi) to Colombo, which took about fifteen hours across the choppy waters of the Palk Strait. Tuticorin was not a convenient port of call. Ships had to dock nearly seven miles from the shore owing to the shallow water. Some official reports noted that women and children were “thrown” from the tugboats that took passengers to the steamers that could not approach the shore. Moreover, during the southwest monsoon, it was particularly difficult to navigate the Strait. Officials worried that this harrowing experience would no doubt create a negative impression of Ceylon in the minds of those being recruited to work there. Over the first decade of the twentieth century, several different proposals were made to entice the Indian government to invest in the railway link. In exchange for the investment in the railway link, the Ceylon Government Railway offered the South Indian Railway limited rights to carry people and goods to and from Trincomalee, arguably Ceylon’s most prominent harbor on its eastern coast. On another occasion, there was a proposal to connect Negapatanam (present-day Nagapattinam) on the Indian coast to ports in the Jaffna peninsula in Sri Lanka. But the most extensive proposals concerned the viability of building a rail link over Adam’s Bridge, the line of shoals and rocks that lay just below the water’s surface, which was ultimately deemed too expensive: it was estimated to cost between Rupees 249,00,000 and 280,00,000! If the railway companies in eastern India could carry railway cars across the Ganga and Hooghly rivers, officials argued, the Indo-Ceylon link across a much smaller distance of twenty-one miles would surely be possible. Although the Ceylon Government was not initially enthusiastic about the project, it became clear over time that a rail link would improve trade and passenger revenue, allow for better quarantine facilities for the imported coolies and make for a better – and shorter – sea voyage for laborers, traders, pilgrims and holidaymakers to travel between India and Ceylon. Ultimately, both the Southern Indian Railway and the Ceylon Government Railway signed on, and the Talaimannar Pier was completed and opened for goods and passenger traffic in 1914. It continued until 1983, when the violence associated with a long-simmering ethnic conflict between the majority Sinhala and minority Tamil communities on the island escalated. The photograph was taken by Dennis McGilvray, an anthropologist who worked and continues to work on Muslims communities in eastern Sri Lanka and the broader Indian Ocean. His co-passengers on the ferry were almost all plantation laborers returning to India (they might also be among the people seen standing on the pier). It is tempting to imagine that this photograph offers us a means of seeing what they saw, especially since there are few textual accounts of this journey from the perspective of the laborers themselves. But what would the view from the deck of the ferry, of a receding Sri Lankan coast have meant to them? Fear that they would be unable to return to the island where they lived, worked, raised families, built communities? Relief that they had escaped the terror of plantation discipline? Exhilaration at having made an escape? These invisible histories are intertwined with those of the Talaimannar Pier. Note: This essay draws on the correspondence included in Ceylon Sessional Papers VII and LXI of 1907, relating to “communication by rail between Ceylon and Southern India”, accessed at the National Archives of Sri Lanka, Colombo. For more about Kalyani’s work, see here.